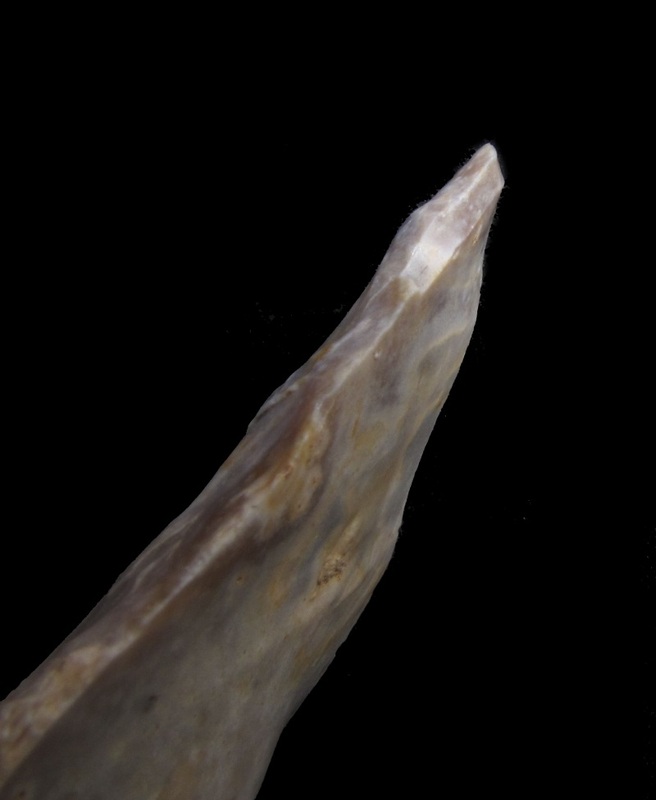 This is a Burin-blow like tip fracture on a retouched Levallois-point from the Levant. Macro-traces on possible Paleolithic projectile points, that are usually interpreted as indicating penetrative weapon use (“diagnostic impact fractures” [DIF] sensu Lombard) are diagnosed if the damage could not have been produced by other tasks such as boring/piercing, on the one hand, and also not from accidents or taphonomic factors on the other hand. Burin-like fractures are generally seen as DIFs. Experimentally, longitudinal macrofractures (burin-like and flute-like fractures) become more frequent as speed increases and as the impact angle decreases, while transversal (snap) fractures are more common in slow impacts. Very early examples of burin-blow impact damage on MSA-points were reported from Gademotta / (Kulkuletti); Ethiopia, dated as early as 279 k.a. years ago by Sale at al. While not questioning other DIFs from the site (for example transversal snap fractures), Katja Douze recently questioned the interpretation of the accidental character of burin-like breakage on tools from the sites in this area. She demonstrated that breakage on the tips of uni- and bifacial convergent tools was rather created intentionally by a highly formalized procedure. This technical process created a lateral tranchet blow, also known from other archaeological contexts (Keilmessergruppe, occasionally in the Acheulian, especially in the Somme Valley). 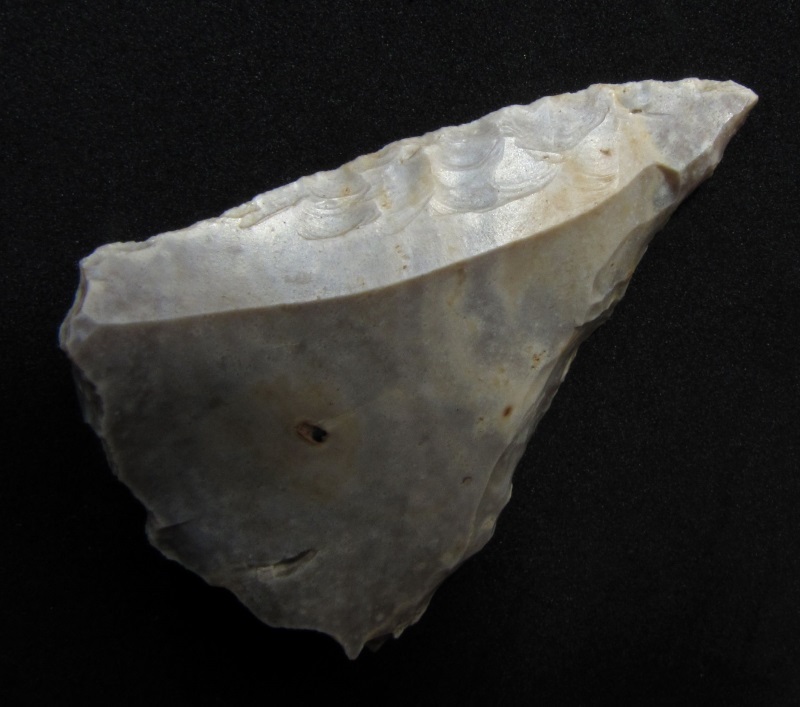 Douze favors the hypothesis that tools with tranchet blow scars were used as cutting tools rather than hunting weapons. Tranchet blows can be differentiated from burin-like fractures by accurate platform preparation before removal and by the recurrence of defined technical steps before before its removal from the convergent instrument. Burin-like fractures, indicative for the use of convergent tools as projectile tips, have been observed in the South African MSA (Kathu Pan: 500 k.a. ?, from several layers at Sibudu with 27% of the examined points exhibiting such fractures), the Levantine Mousterian (Tabun D and B- facies; for example: Unit IX of Tabun Cave [Tabun D] :12.5% of the Levallois points) and from the European Mousterian since MIS 6 (Bouheben, La Cotte).